One month ago, I published an article (pictured right) about PowerPoint litigation graphics that you just could not believe were in PowerPoint. I was quite surprised by the attention it generated. Five-times the number of normal readers have read that article, and it so far has 75 Facebook likes, 20 Google+ +1's and 77 shares on LinkedIn. From those readership statistics, I knew we had a topic that people wanted to know a lot more about. So, I asked my A2L colleague Ryan Flax, Esq., who is arguably the foremost authority on how best to use litigation graphics at trial, to conduct a free webinar on the topic. I'm pleased to share the news that this webinar, PowerPoint Litigation Graphics - Winning by Design, will be conducted live next week - and yes, it is completely free and without any obligation. Over the past six months, we have hosted many online webinars and CLE's. Most notable and well-attended were Patent Litigation Graphics and Storytelling in Litigation. Combined, more than 1,000 attendees have watched those webinars so far. About half of the attendees were from AmLaw 200 law firms, and half were from a combination of smaller firms, competitors, governments and other institutions. Before A2L created its award winning jury consulting operation and it's courtroom technology operation, it was a litigation graphics firm. Now in our 19th year, litigation graphics are still something I am passionate about. For me and for people like Ryan, the creation of persuasive visual evidence is something that mostly comes naturally. But, creating an effective trial presentation would not be possible without the amazing team of highly trained and experienced litigation consultants and litigation graphics artists we have on staff here. Many of the important lessons we've learned from our work will be shared at this webinar. Why bullet points almost always do damage to your presentation. 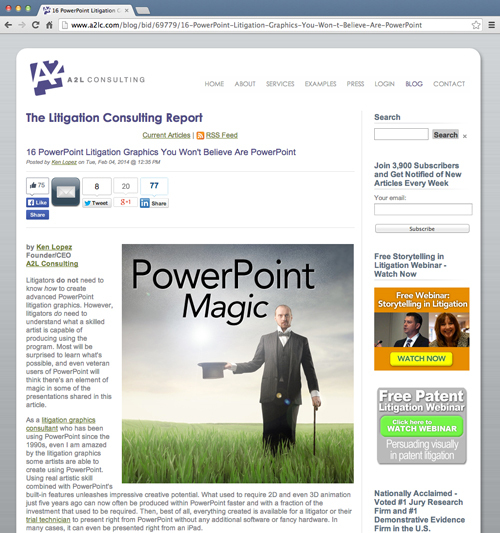 The real science behind what works with litigation graphics and what does not. How to weave litigation graphics into a story you are telling at trial. How to use complementary rather than competing graphics in a visual presentation. Ryan Flax, the webinar's presenter, is an experienced litigator. As such, the webinar will be directed at anyone who spends time in a courtroom or who makes persuasive presentations for a living. With that said, litigation support professionals and those who aspire to persuade others with visual tools will find significant value in this presentation. I hope that you'll take a moment to register for this free webinar, PowerPoint Litigation Graphics - Winning by Design. If you have a schedule conflict on Tuesday, March 18th at 1:30pm ET, register anyway, and we'll send you an archived version after the live webinar occurs.